It's time to say goodbye to Chip Zdarsky; this is his last issue of Peter Parker. He takes up the art reins for this farewell special and delivers a timeless love-letter to our Friendly Neighbourhood Spider-Man. If you're any sort of a Spidey-fan, you don't want to miss this powerful stand-alone story. The story starts with "vox pop" shots, isolated snaps of random characters directly addressing the camera. This will eventually be revealed as footage collected for a film student's Spider-Man documentary. There's a much bigger structural surprise that comes much earlier. After the first action scene, the realization dawns that the characters being interviewed aren't all that random. There's a bigger narrative threaded through the talking. There's also a comedy relief vignette about a hotdog vendor, but it falls away to focus on a core story about Spidey's interactions with one particular neighbour. Kyle's a struggling kid who nearly turned to crime before Spider-Man took an interest. Kyle's story delivers some extra heartwarming beats to confirm it's firmly latched onto you. Then it starts wrenching your feelings around with shockingly grim developments. I'm not entirely in love with the last page of the story, which revisits the vox pop setup in order to drop a pret-a-porter theme statement in your lap. Ask me about the unstated theme conveyed in the wordless climax of Kyle's story, though. That is the truly insightful, all-time great demonstration of what Spidey's all about. Corny jokes and cribbing free hotdogs, sure. But Spider-Man is also about heartbreak, and this issue pulls no punches in delivering a textbook example of the same. The visuals that go along with the words are bold and simple, but do not think for a moment that they veer into simplistic. Mr. Zdarsky demonstrates an exquisite command of facial expressions. Kyle's mom, in particular, is called on to show off a tremendous range of emotion. For this story to work, she has to convey even more through her appearance than she does in her words. 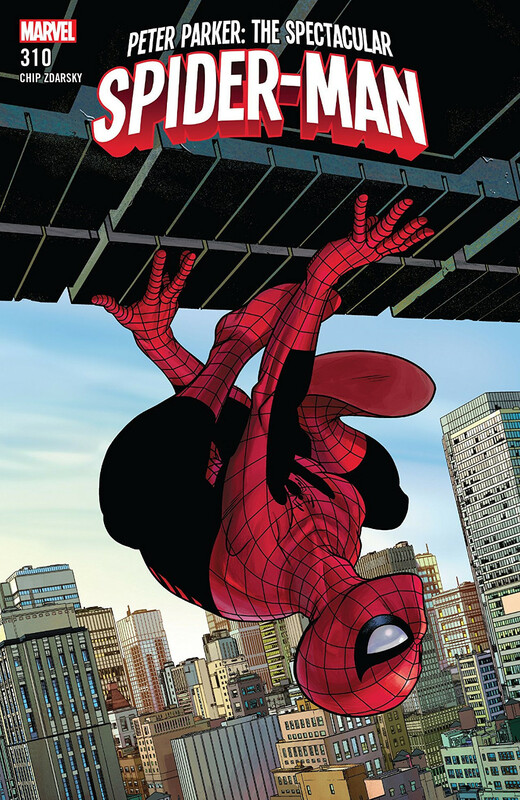 It's a tall order, but Mr. Zdarsky's art fills it to perfection. There's also an incredible continuity link in the final action scene. In just a few big panels, with a warehouse setting and carefully-modulated colours, Mr. Zdarsky successfully ties back to Spidey's very first adventure in Amazing Fantasy #15. This is not the first time a heartbroken Spidey's faced down petty crooks in a grim-looking warehouse, and the visuals subtly draw you toward recognizing that link. If you have access to a print of Amazing Fantasy #15, compare the last few pages of Spidey's debut strip to this issue's warehouse showdown. Mr. Zdarsky is having a direct dialogue with the late, great Mr. Ditko.